I just traded in my VW for a Subaru. I saved money and miles in the process, but I'm still thousands of dollars in debt. Cain's offering was not accepted by God because he offered it as if he was paying back a debt. Perhaps many of us have a skewed understanding and practice of spiritual worship because we are so accustomed to paying back (or not paying back) our earthly debts. I certainly do not delight myself in writing out my car payment and mortgage checks, but, judging by where most of my money goes, I obviously worship my possessions to a certain degree. Can you imagine the clarity and discernment of God's will we might have if we were free of debt and relied on fewer earthly possessions? Jesus clearly heard the Father's voice, and He had no place to rest His head. Jesus told the rich man to sell all he had. The disciples told the church to do the same thing. I don't know how this would work in America. I won't say what kind of car Sean just bought. Worship is doing good and sharing what we have. This is contrary to how I have traditionally understood worship, as acts of devotion to God, such as praying, singing, and meditating. For some reason I have separated worship from good works. Loving others has been placed in different category in my mind, maybe in the missions compartment. The two cannot be separated, however. Worship is loving others. I recently had a conversation with my friend Adam about how the Church can worship by doing good works. Our church is located in a middle-upper class suburb of Chicago. There doesn't seem to be much need in our community in terms of caring for the poor, sick, etc. We do collect food and distribute it in a neighboring town. And we do reach out to the community in other practical ways, attempting to share God's love with people. Adam and I were a bit discouraged, however, because it seems like there is such little opportunity to do church the way the early church did. We are preoccupied with so many things, like jobs, kids, and meetings, and we are left with very little time to be the church, or at least be involved in church activities. "Let’s take it as an assumption that a central concern of Christians is to care for the poor. What if one lives in a nation, such as Denmark, or in a suburb, such as we live in, where there aren’t many poor. Of course, if you get your ear close enough to the ground, there are still some poor in these places. But, there aren’t that many. So, what is the church to do? How central is care for the poor and the downtrodden, or the sick and unhealthy, to the mission of God in the way of Jesus? To carry out the mission of Jesus do we have to relocate to where the poor are? "Making care for the poor, along with any marginalized person, central to the mission of God in the way of Jesus misconstrues the gospel and the missional life. I want to contend that making care for the poor the center of it all gets things backward. "Jesus’ mission was to love God and to love others — and you can express this central motif of Jesus in a variety of ways — and only because Jesus expanded the meaning of “others” do the poor come into the picture. In other words, we love the poor not because they are poor but because we love them as Eikons of God (made in the image of God). We love the poor because they happen to be Eikons who are also our neighbors. We don’t have to make the poor our neighbors in order to love the other. "Because we love others we love the poor; loving the poor is not the only “other” we are called to love. We are called to love all others, including the poor, but not only the poor. Our mission is to love the other, whoever that might be. "The genuinely loving person loves all others. In fact, that person finds the needs in others and knows that needs cannot be limited to socio-economic condition; some need friendship, etc. "Or, and this is my contention, are they to look out their window, listen to the voices of their neighbors — both here and beyond, learn about the needs of those around them, and link to them in love in a local way? Yes, I think this is the central mission. "Do we care for the poor in other places? Of course. Do we extend grace to those in the inner city when we live in suburbs? Of course. Do we extend mercy to those in the world who are in need — AIDS, Darfur, tsunami victims — of course. "But why? Because we are called to love the other and we have observed them in our journey with Jesus." Why is it that you scream and cheer while watching your favorite sports team, but you show such little expression in worship? 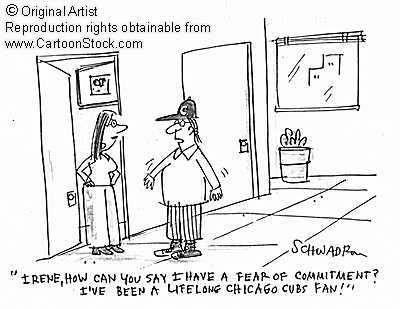 I love the Cubs, and I fear that I am more committed to listening to Ron and Pat on WGN radio than I am to listening to God in prayer. I fear that many American Christians are like me. Only six people showed up to our church prayer meeting the other day, which, ironically, is called "Devoted". We meet two Wednesday nights per month to praise God in song and to pray. It is always a somber gathering. I miss the days as a teen when we would have all-nighters, screaming in prayer; albeit not really knowing much about God, but passionate nonetheless. Do we just not believe in God's providence unfolding through prayer? Do we even believe we need God anymore? Are we just too comfortable in our death-gripped homes? Are we just too busy working at our jobs and idolizing our kids? Do we even have time to evangelize, or simply discover what evangelism is today? Have we been entirely Americanized? My former understanding of worship was very Cain-like: "Don't you owe it to God for all that He's done for You?" I really enjoyed reading Ryan's last two posts about offerings, but if you're like me, you're probably wondering how to apply these wonderful truths to our worship. One practical way of sharing these truths is through a song that I am currently using congregationally in musical worship. 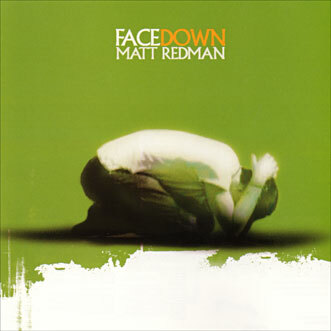 The lyrics to Matt Redman's "Breathing The Breath" really bring to us an accurate perspective of God and man. The song is a very singable tune and also incorporates a 7/4 meter in the ending chorus, making this song, both musically and lyrically, a breath of fresh air compared to typical contemporary praise and worship songs. That it should be paid back to him? As if You needed anything? The truths in this song which are great to point out to a congregation are: 1) We owe our very ability to worship to Christ alone. The Spirit of Christ in us enables us to worship him in multiple ways. 2) Worship is more than just musical worship. We live (or breathe) as an act of worship, and we sing songs as one artistic expression of this life of worship. 3) Simply, "Of Him and to Him and through Him are all things." While leading this song, it may be helpful to share these Scripture passages with the church. The following is Calvin's Commentary on the offerings of Abel and Cain. I took the liberty of breaking it down into paragraphs and main points. Hopefully, it will be a bit easier to read. The truth here is astounding. There is much to learn from this the first act of worship in the Bible. And the Lord had respect unto Abel and to his offering, but unto Cain and to his offering he had not respect (Gen. 4:4b-5a). God will regard no works with favour except those the doer of which is already previously accepted and approved by him. And no wonder; for man sees things which are apparent, but God looks into the heart, (1 Sam. 16: 7;) therefore, he estimates works no otherwise than as they proceed from the fountain of the heart. Whence also it happens, that he not only rejects but abhors the sacrifices of the wicked, however splendid they may appear in the eyes of men. For if he, who is polluted in his soul, by his mere touch contaminates, with his own impurities, things otherwise pure and clean, how can that but be impure which proceeds from himself? When God repudiates the feigned righteousness in which the Jews were glorying, he objects, through his Prophet, that their hands were "full of blood," (Isaiah 1: 15.) For the same reason Haggai contends against the hypocrites. The external appearance, therefore, of works, which may delude our too carnal eyes, vanishes in the presence of God. Nor were even the heathens ignorant of this; whose poets, when they speak with a sober and well-regulated mind of the worship of God, require both a clean heart and pure hands. Hence, even among all nations, is to be traced the solemn rite of washing before sacrifices. all works done before faith, whatever splendour of righteousness may appear in them, were nothing but mere sins, being defiled from their roots, and were offensive to the Lord, whom nothing can please without inward purity of heart. I wish they who imagine that men, by their own motion of freewill, are rendered meet to receive the grace of God, would reflect on this. Certainly, no controversy would then remain on the question, whether God justifies men gratuitously, and that by faith? For this must be received as a settled point, that, in the judgment of God, no respect is had to works until man is received into favour. since the whole human race is hateful to God, there is no other way of reconciliation to divine favour than through faith. since faith is a gratuitous gift of God, and a special illumination of the Spirit, then it is easy to infer, that we are prevented by his mere grace, just as if he had raised us from the dead. In which sense also Peter says, that it is God who purifies the hearts by faith. For there would be no agreement of the fact with the statement, unless God had so formed faith in the hearts of men that it might be truly deemed his gift. It may now be seen in what way purity is the effect of faith. It is a vapid and trifling philosophy, to adduce this as the cause of purity, that men are not induced to seek God as their rewarder except by faith. They who speak thus entirely bury the grace of God, which his Spirit chiefly commends. Others also speak coldly, who teach that we are purified by faiths only on account of the gift of regenerations in order that we may be accepted of God. For not only do they omit half the truth, but build without a foundation; since, on account of the curse on the human race, it became necessary that gratuitous reconciliation should precede. since God never so regenerates his people in this world, that they can worship him perfectly; no work of man can possibly be acceptable without expiation. And to this point the ceremony of legal washing belongs, in order that men may learn, that as often as they wish to draw near unto God, purity must be sought elsewhere. Wherefore God will then at length have respect to our obedience, when he looks upon us in Christ. he wished to appease God, as one discharging a debt, by external sacrifices, without the least intention of dedicating himself to God. he rejects with contempt the works of those who withdraw themselves from him. For it is his will, first to have us devoted to himself; he then seeks our works in testimony of our obedience to him, but only in the second place. all the figments by which men mock both God and themselves are the fruits of unbelief: To this is added pride, because unbelievers, despising the Mediator's grace, throw themselves fearlessly into the presence of God. 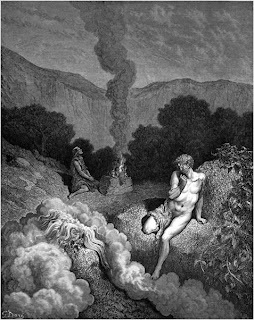 The Jews foolishly imagine that the oblations of Cain were unacceptable, because he defrauded God of the full ears of corn, and meanly offered him only barren or half-filled ears. Deeper and more hidden was the evil; namely that impurity of heart of which I have been speaking; just as, on the other hand, the strong scent of burning fat could not conciliate the divine favour to the sacrifices of Abel; but, being pervaded by the good odour of faith, they had a sweet-smelling savour. I was reading Hebrews 10 today and was reminded of an amazing truth about worship; namely, that I can't worship. "Why, Ryan, what ever could you mean by uttering such nonsense?" "Where there is forgiveness of these [sins], there is no longer any offering for sin" (Heb. 10:18). Now, think about worship. Think about the language we use when we pray and sing. What's going on in our minds when we worship God? Sadly, our thoughts often focus on "what I can give," "my offering," whether "my sacrifice" is pure enough to be accepted by God. These are very Jewish thoughts, because in them there is no mediator. We worship as if we each have a direct line to God the Father, and that we can please Him. Less often do we acknowledge the work of Christ in our worship. Sure we talk and sing about Jesus dying for us, but how can we have true faith in Christ if we still believe we have something to offer? The truth is, we have nothing to give to God. All we can do is by the Spirit of faith enter into Christ's sacrifice before the Father. We add nothing to it. After all, God takes no pleasure in our offerings. Only Christ's offering pleases God (Heb. 10:5-10). "But Ryan, doesn't Hebrews 13 tell us to bring a sacrifice of praise to God?" My offering? Sin that brings death. Christ's offering? Death that brings life. Where do you set up your altar? Who or what do you worship? We Americans worship food and television among other things. Take a few minutes and listen to and read what Mark Driscoll and the Bible have to say. "Worshiping in spirit is the opposite of worshiping in merely external ways. It is the opposite of empty formalism and traditionalism. Worshiping in truth is the opposite of worship based on an inadequate view of God. Worship must have heart and worship must engage emotions and thought. "Truth without emotion produces dead orthodoxy and a church full (or half full) of artificial admirers (like people who write generic anniversary cards for a living). On the other hand, emotion without truth produces empty frenzy and cultivates shallow people who refuse the discipline of rigorous thought. But true worship comes from people who are deeply emotional and who love deep and sound doctrine. Strong affections for God rooted in truth are the bone and marrow of biblical worship." 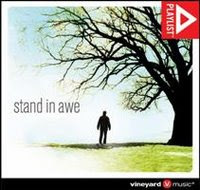 Stand In Awe, Vineyard Music's latest album, has been released. See previous post about the Christ-centered content of this record, and for an mp3 of "Christ Is Exalted." The content of this song was derived from the Shorter Chatechism, questions 20-22, 27, 28. Tim had never played in a band, written a song, or played an electric guitar. Additionally, he did not know how to sing, and it sounded like he had been hit by a car when he tried to hit high notes. But I really liked Tim because he is one of the few manly men whom I have ever seen leading worship. I am not supposed to say this, but most of the worship dudes I have heard are not very dudely. They seem to be very in touch with their feelings and exceedingly chickified from playing too much acoustic guitar and singing prom songs to Jesus while channeling Michael Bolton and flipping their hair. Tim was a guy who brewed his own beer, smoked a pipe, rock climbed, mountain biked, river rafted, carried a knife on his belt, and talked about what he thought more than what he felt. We clicked because I drive a 1978 Chevy truck that gets single digits to the gallon and has a bacon air freshener and no functioning speedometer and because I fashion myself as the self-appointed leader of a heterosexual male backlash in our overly chickified city filled with guys drinking herbal tea and rocking out to Mariah Carey in their lemon yellow Volkswagen Cabriolets while wearing fuchsia sweater vests that perfectly match their open-toed shoes. Anyways, Tim learned quickly, took vocal lessons, and soon assumed leadership over the entire worship department. I flipped my hair out of my eyes while leading worship yesterday. Sean told me his hair is long enough to pull back into a pony. In addition to the questions listed in my last post, I'd like to spend time thinking about a greater mission God calls us to in musical worship. My church has recently partnered with an organization in northern Ethiopia. Part of their mission is to train native church planters to care for widows and orphans by providing them with basic medical treatment and education. They also encourage better care for the environment and simple microenterprise for the natives to survive economically. In parts of Asia the same organization teaches farmers how to grow coffee so they won't have to sell their daughters for sixty or seventy dollars into prostitution, where a young girl will usually die within four years, before her eighteenth birthday. The organization's mission in northern India is to stop the spread of disease and death due to rodent infestation. The same rats, worshiped by the natives, are roaming the fields, eating the crops, and causing the sickness and starvation, and the people are unaware that the rats, their gods, are killing them. When I think of young girls being sold as slaves, orphans with aids, and people dying of starvation and disease, when I ask God to give me His heart for these people, it makes it more difficult for me to "put on a performance" while leading musical worship. Rather, I am compelled to point people to the truth of Christ and His mission. I have been trying to keep a global perspective while worshiping God in song. In doing so, my selfish and sinful desires in musical worship are being brought to light; How I consume, perform, and forget that people are dying. It becomes harder to sing songs that focus solely on how God is "mindful of me" and that "I am a friend of God" when I think of the greater mission. The truth is I call on God when I'm stuck in traffic as if He's mindful of my gas mileage, while some poor, innocent girl is suffering and wondering if there is a God who can deliver her. And what kind of friend of God am I to put all of my time into a Sunday service without considering the people worldwide who don't know Christ and of those laboring as His hands and feet? The songs we sing can either aid or hinder us in this mission. Let's allow what we do on Sunday to point us to the greater mission, and while we are reaching people stateside, let's direct their attention to the mission and heart of compassion God has for the entire world, not just us. So as I'm standing in front of the church, leading them in songs, Scripture reading, and prayer, my goal is not to "lead them into God's presence," but to help them remember and celebrate what Christ has accomplished for them through his righteous life, atoning death, and glorious resurrection. Most churches virtually, if not entirely, omit at least one of these four major aspects of worship for the sake of time. Mars Hill began with only a few songs, a sermon, and monthly communion but over the years has grown to include each of the four major aspects of a worship service. Because of this, our worship service takes up to two hours and is an event that people simply make time for, not unlike a big concert or movie. We made the sermon the hinge for the service, with time for repentance, giving, communion, and most of the congregational singing following the sermon to provide people an opportunity to process God's Word and respond to his initiation in their lives. Three things I particularly appreciate about this: 1) the centrality of the Word, 2) worship songs being used as a means for the church to respond to God's Word, and 3) weekly communion. 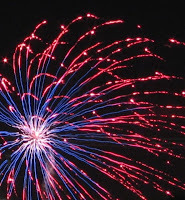 Last evening I was sitting in my air conditioned home, slouched on the couch, feet on the coffee table, remote in hand, to my right the full sliding glass door through which I could see the right half of the town fireworks 200 yards away above the treeline. Had I sat in the lawn chair on the patio I could have had an unobstructed view, but a) it was too hot, b) at least I could see half of each colorful explosion, c) I was watching Will Traveler, and d) I was tired, comfortable, and enjoying my bowl of Honey Nut Cheerios. Does it make me less patriotic because I didn't devote my full attention to America's birthday party? Or am I more so because I delighted in multiple kinds of American cake? "Did the congregation like the songs?" "Did the people respond well?" "How did the sound men do?" "Did the band and singers sound good?" "Was the Gospel shared within the musical worship set?" "Did we attempt to point people to respond musically to Scripture?" "Did we invite the people to respond to God, or observe men?" "Did the songs have a good balance of 'affection' and 'truth'?" "Did the songs speak of essential truths of the Christian faith (the Trinity, the cross, the resurrection, sin, etc.)?" As we take up our oars and begin rowing it would be helpful to hear your own definitions of worship. Based on your understanding of Christian worship both through Scripture and your personal experiences, what is it? Does the ship need to be turned around, or are things just fine the way they are?